Martin O’Neill’s cruised past Oman. Robbie Keane celebrates his goal. IT WAS THE goal we were all waiting for. 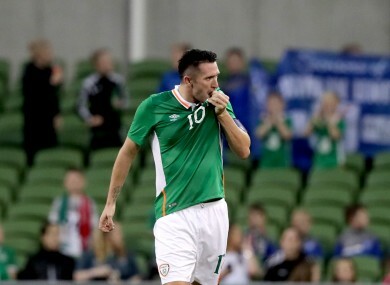 Robbie Keane will say goodbye to international football with his name on the scoresheet and not only that, but it was a strike for the scrapbook. Keane’s effort on 30 minutes showcased his delicate touch and finishing instincts are as sharp as ever, getting on Johnny Walters’ flick to put Ireland 2-0 ahead against Oman. It was Keane’s 68th goal in his 146th and final appearance for Ireland, a career which began 18 years ago. Euro 2016 hero Robbie Brady had earlier got Keane’s farewell night off to the perfect start. After Walters did well to win a free-kick just outside the area on eight minutes, the left-sided Norwich star found the net with a delicious effort that went just inside Oman goalkeeper Faiz Al Rushaidi’s left-hand post. Walters soon got in the act himself, putting Ireland 3-0 up on 34 minutes when he headed in a perfectly weighted cross from Brady before his second sealed the win. Email “Perfect goodbye: Keane scores stunner in international farewell for Ireland”. Feedback on “Perfect goodbye: Keane scores stunner in international farewell for Ireland”.